I only had a glimpse of Kansai when our bullet train traverse the area on my way to Okayama from Tokyo many years ago. I had also read it countless of times as the center of Japanese culture and history. This was also frequently mentioned when I was still studying Japanese Language and Culture at the Japanese Embassy in Manila. Being a traveler who value locations with cultural and historical importance, Kansai ignites my interest. Kansai is composed of Osaka, Hyogo, Kyoto, Nara, Wakayama, and Shiga prefectures. A collection of World Heritage Sites and lavish distribution of epicurean delights made Kansai a haven for tourists from all over the world. Since my stay at Kansai was only for a week, I opted to visit just three prefectures; Kyoto, Nara, and Osaka. Literally, there are so many sites to visit in Kansai had I only have enough time and resources for it. I proceeded directly to Kyoto upon landing at Kansai International Airport from Manila. My capsule hotel, which is located in Gion, was my home away from home for the next 4 days. 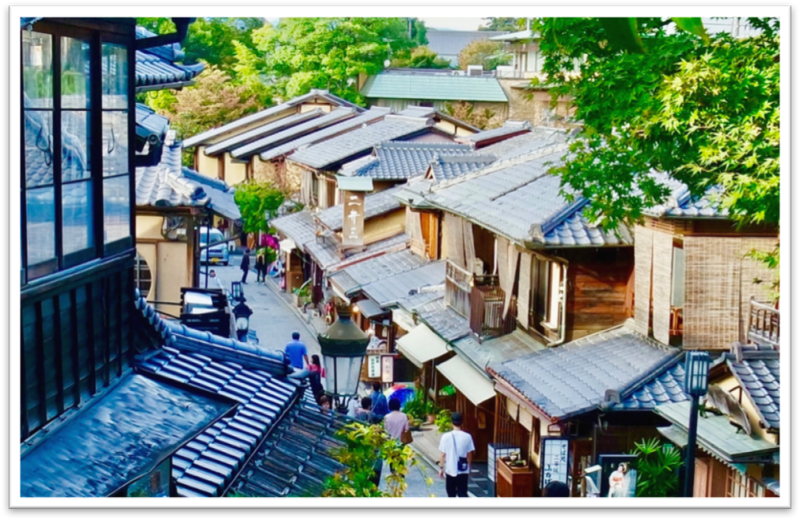 Aside from being a destination itself, I chose Gion because of its location which is walking distance to a handful of sites like Yasaka Jinja, Kiyomizudera, Maruyama Koen, and Chion-In Temple. A quaint gate along Gion. Gion was actually the backdrop in the film “Memoirs of a Geisha”, where streetscape has retained its former glory hundreds of years ago. I had this strange feeling of being in a pre-samurai period when walking in Gion where one can still chance upon a real geisha and her maiko at nighttime. Day 1 for me in Kyoto was a visit to Kinkaku-ji Temple, then Sagano Bamboo Forest and Togetsuko Bridge in Arashiyama. My afternoon was spent exploring Nishi and Higashi Hongan-ji temples. Despite the years of staying in Japan before, I was actually baffled about the difference between a shrine and a temple. That was clarified to me in this trip. 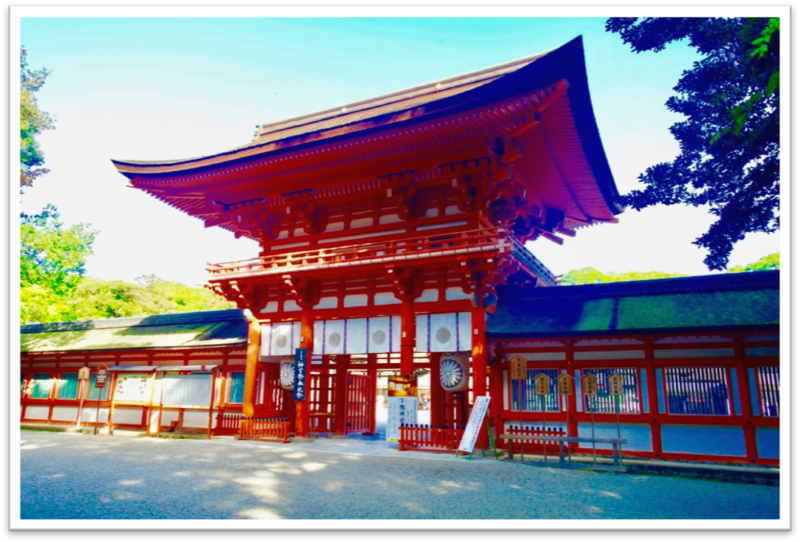 Shrine (Jinja) is a Shinto site while temple (Ji) is a Buddhist site. Don’t ask me about the difference between Shinto and Buddhism as it will take a lot of explanation to differentiate the two religions. Kinkaku-ji was the very first tourist site I visited that day. It was so astonishing. I can spend an entire day appreciating its pavilion made of pure gold leaf. It is literally shimmering against the dense forest background and as reflected in tranquil pond below. It was built in 1393 as a retirement place for shogun and now a considered as UNESCO World Heritage Site. According to a Japanese that I talked with, the temple now functions as the place where Budha’s ashes are kept. (I just took bus #12 from Gion to reach Kinkaku-ji. Entrance fee is Y400). Can’t afford to remove this place from my itinerary. 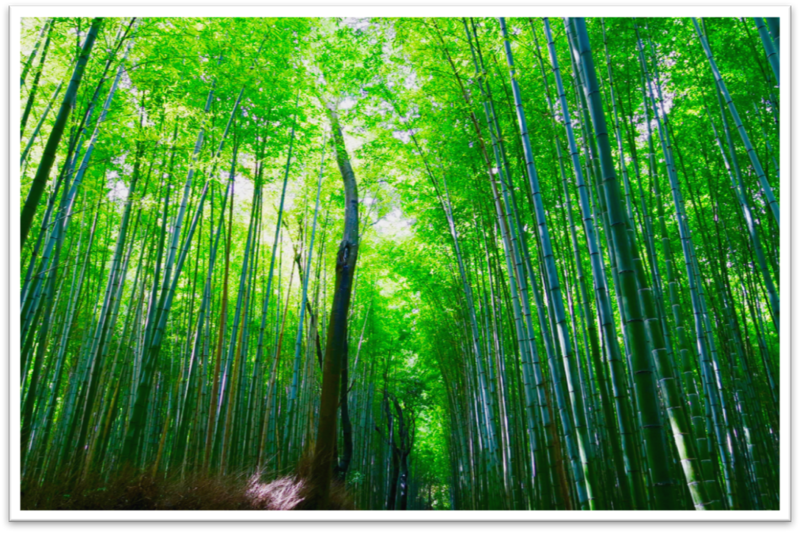 Next stop was Sagano Bamboo Forest. I don’t think pictures can give justice to the beauty of this grove. CNN even referred to it as one of the most beautiful groves on Earth. 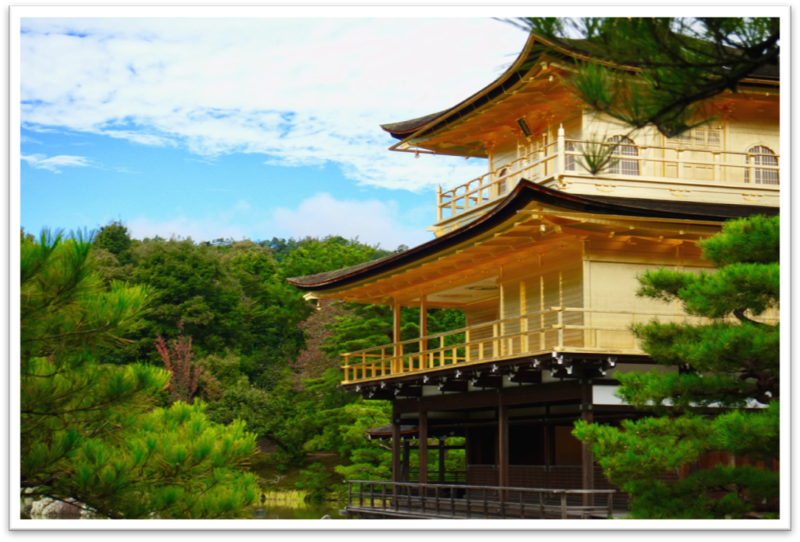 (This site is two short bus ride away from Kinkakuji Temple. (I took bus #59 from the Golden Pavilion then transferred to bus #11 to reach Sagano Bamboo Grove). On my way to bus stop going to Hongan-ji temples is the Togetsuko Bridge (or the Crossing Moon Bridge). 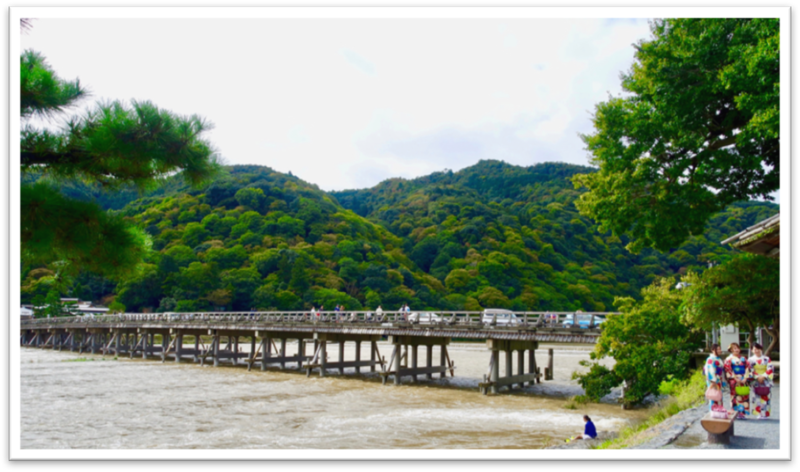 Built between 7th and 10th century, this bridge was constructed to enjoy spectacular views of the Katsura River below and the forested Arashiyama mountain above. The present bridge was rebuilt in steel in 1934, faithfully copying the structure and design of the original. It was unfortunate though that the timing of my visit was a couple of weeks early for Koyo (autumn) season. The site could have been more spectacular. Main temple of Nishi Honganji. My last destination for the day, the Honganji Temples are two overwhelmingly large wooden temples in the center of busy Kyoto, near Kyoto Tower. 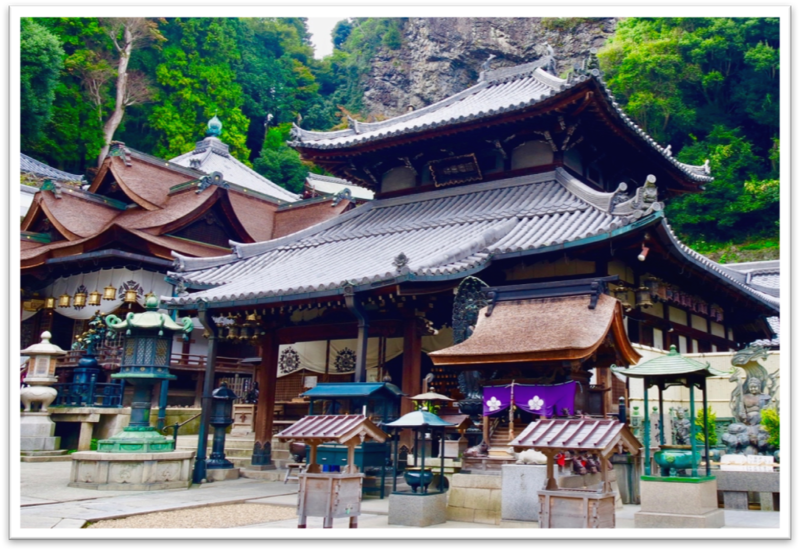 Ironically, despite its status as UNESCO World Heritage Site, its beauty, serenity, and importance to Japanese Buddhists, the temples itself were not swarmed by tourists, unlike the two sites that I earlier visited. The ornate main gate of Higashi Honganji. 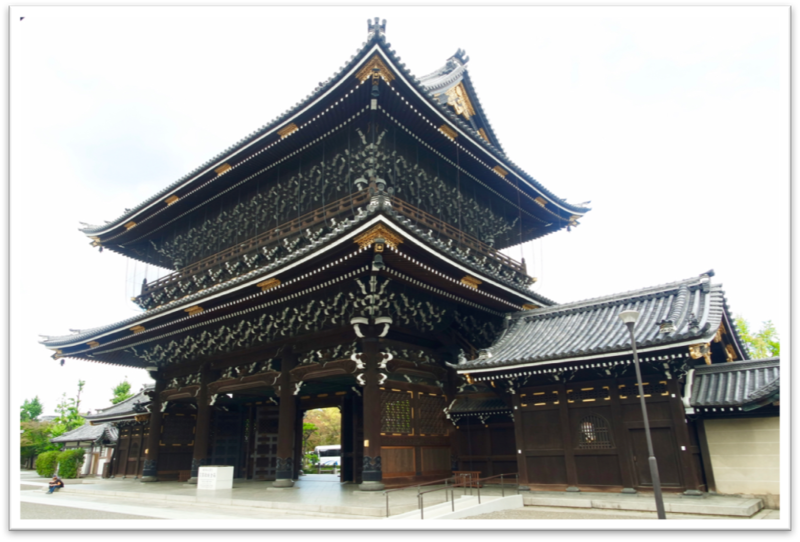 The temples are relatively young, Nishi Honganji was built in 1591 while Higashi Honganji was built only 11 years after and situated a few blocks east of Nishi Honganji. Surpisingly, admission to the two temples is completely free and most of the buildings can be entered without restriction. I tell you these temples are awesome. My Day 2 itinerary includes Shimogamo and Kamigamo Shrines in the morning and in the afternoon were Fushimi Inari shrine and Kiyomizudera. I also intend to wander along preserved streets of Ninen-zaka and Sannen-zaka all the way to Maruyama Koen which is walking distance to my hotel. Shimogamo was first on my list that day. 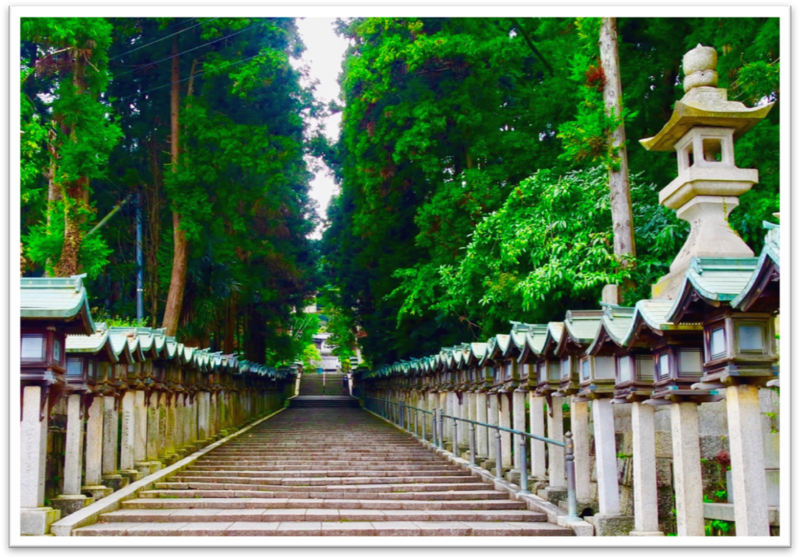 Shimogamo Shrine is one of the oldest Shinto shrines in Japan, dating 6th century, even before Kyoto became the capital of Japan. It is surrounded by the Tadasu no Mori, a forest which was preserved during the modernization of the city and contains trees that are up to 600 years old. (It can be reached through bus #4 from Gion). The two sand cones of Kamigamo jinja. Next is Kamigamo Shrine which was built some 100 years after and stands three and a half kilometers upriver from its sister Shimogamo Shrine. 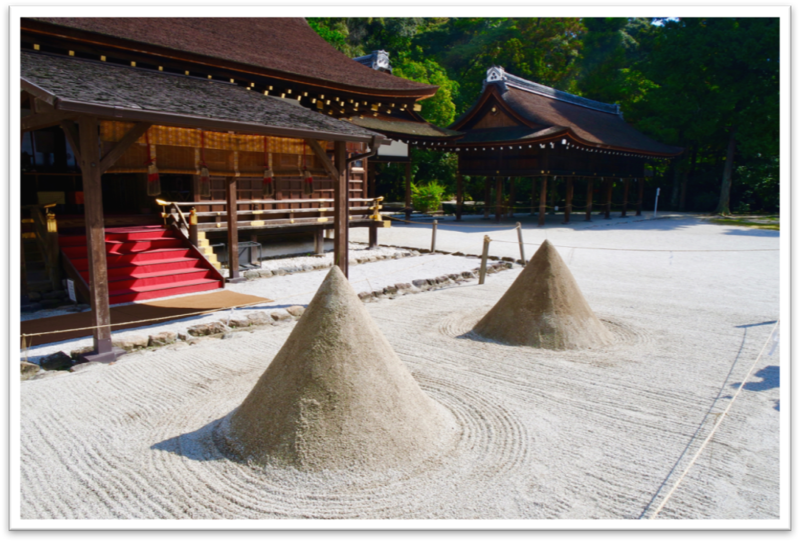 It is well known for two sand cones on its grounds that serve a purification function for the shrine, and have been made ritually since ancient times. Both shrines are World Heritage Sites and do not charge admission fee. About lunch time when I reached Kyoto Station from Kamigamo Shrine through bus #4. After a quick lunch of onigiri and bottled fruit flavored milk, I jumped to bus#5 bound to Fushimi Inari Taisha, another World Heritage Site. Fushimi Inari was founded in 711 by the Hata family and its principal deity is Ukanomitama-no-Mikoto – the goddess of rice and food. At the back of the shrine is the the entrance to 4 kilometer trails up mountain covered with thousands of vermillion colored torii gates donated by individuals and companies, praying for good bounty. Some geisha under the torii gates of Fushimi Inari shrine. 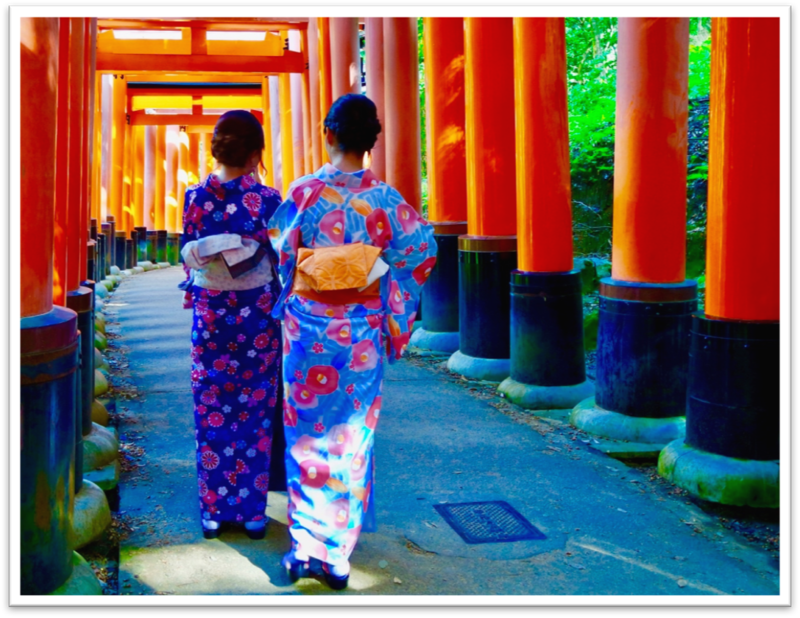 Expect a lot of tourists there as it is too popular to visitors not just because it is a World Heritage Site but due to its distinctive orange colored torii gates that is IG worthy in any selfie. 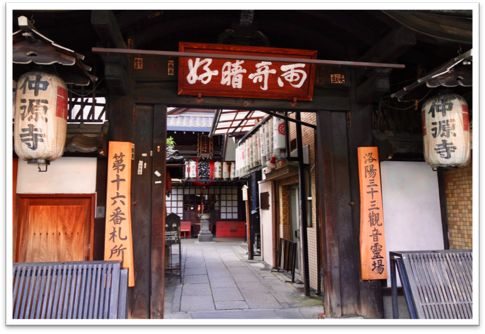 The place is known as a location in one of the scenes in Hollywood movie “Memoirs of a Geisha” and been also featured in hundreds of magazine articles about Japan, that is why for most tourists, this site is a must. After traversing some parts of the trail and giving respect to the Shinto Gods, I left the place around 2PM, took bus going to Kyoto Station, then transferred to bus #100 bound to Kiyomizudera. Three storied pagoda at the gates of Kiyomizudera. I didn’t expect Kiyomizudera to be a lot more touristy and mercantile than Fushimi Inari. Founded 778 by Sakanoue no Tamuramaro, this Buddhist temple is a UNESCO World Heritage site and was one of 20 finalists for the New 7Wonders of the World. Indeed, the temple is of great beauty and offers impressive view of Kyoto City. I just hoped that it exudes serene mood, because it is a place for worship, and not that chaotic atmosphere identical of a marketplace. Kiyomizudera charges Y300 admission fee. Charming streets of Ninnen-zaka and Sannen-zaka. Mind your steps though. I left Kiyomizudera earlier than planned and walked to nearby Ninen-zaka and Sannen-zaka preserved districts. These are pedestrian only walkways lined with beautifully restored traditional shophouses that give the most nostalgic strolling in the whole city. In fact, this is where you can imagine (and feel) what Kyoto looked like before it embraced modernization. Some tea houses offer free taste of their exquisite tea offerings and matcha cakes, which I admit to have took advantage of. It was almost dark when I ended that reflective walk in those preserved Zaka districts all the way to Maruyama-koen. My soul was overjoyed with so many historical sights almost forgetting that I need to feed my physical body with some decent food. After devouring a hefty bowl of ramen in one of hole-in-the-wall restos at Gion, I decided to call it a day and succumb to the comfort of my capsule. Day 3 was Nara day for me. 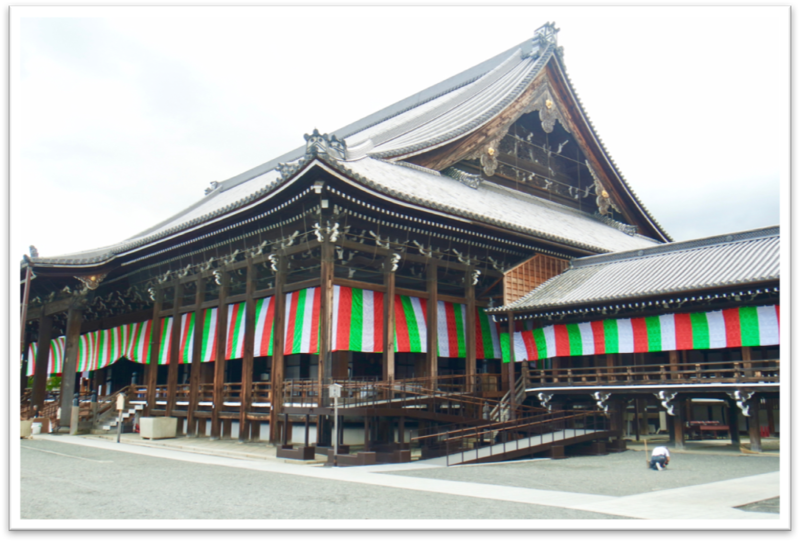 I became interested in Nara upon learning that it was the capital of Japan from 710 to 794. Not only did it captivate me with its rich history but also enlivened my spirituality in a more profound way. There are so many historical shrines and temples in Nara but I opted to visit only four because I find them most meaningful. Using Kintetsu Rail Pass (1-Day Y1,500), I left early from Kyoto Station to Kintetsu Nara station. I took Kintetsu because its station is nearer to Nara Koen than JR station. 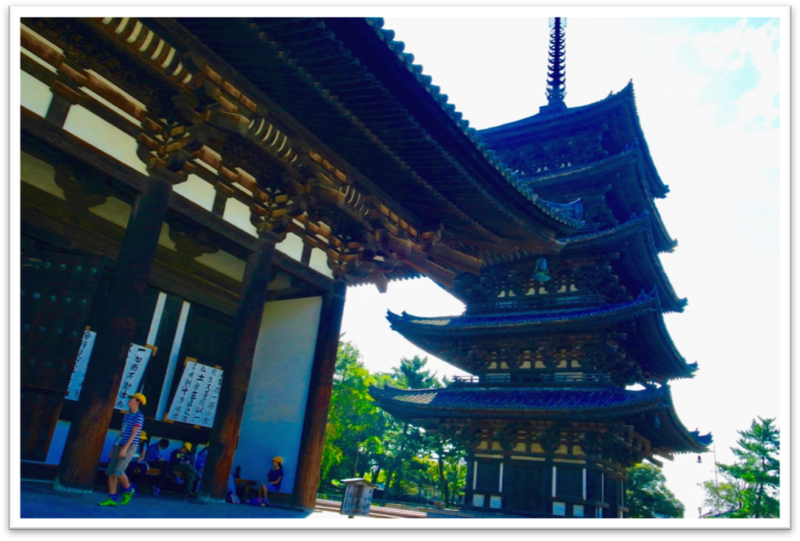 Five storied pagoda of Kofukuji, second tallest in Japan. Few meters outside Kintetsu Nara station is Kofukuji Temple. Established within the same year Nara became Japan’s capital in 710. Now a World Heritage Site, this temple is a sight with great historic value. I just visited the Eastern Golden Hall and its Five Story Pagoda which is Japan’s second tallest. 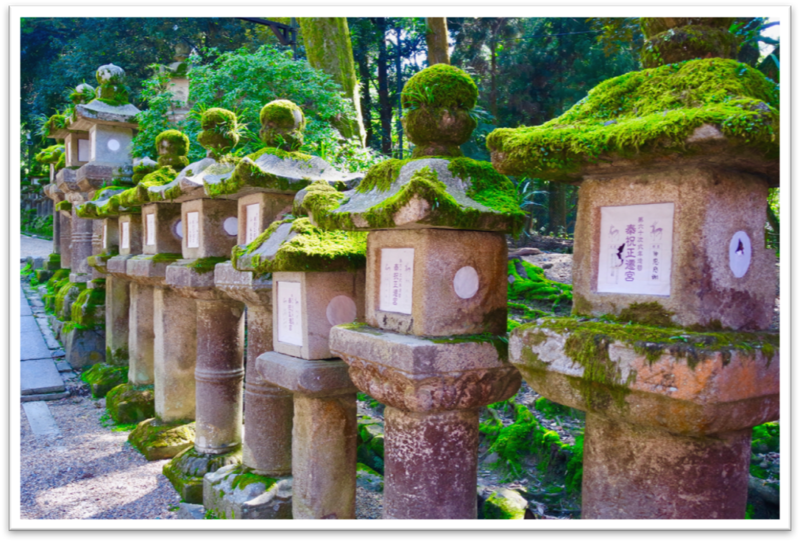 Stone lanterns leading to Kasuga taisha. Next on my list was Kasuga Taisha Shrine, which is a couple of kilometers away from Kofukuji Temple. I did a leisurely stroll within Nara Koen Park, meet hundreds of free roaming deers that are mostly docile and, in no time, started the meditative walk on a pathway lined with astonishing number of moss covered stone lanterns. These lanterns appear to be standing there for centuries as Nara creates history. Seated at the end of this pathway is the Kasuga Taisha Shrine, built in 768 and is one of the most important Shinto Shrines in Japanese history. Admission to this World Heritage Site is free. The shrine itself features vermillion colored pillars, intricate structures, and hundreds of bronze lanterns. In its botanical garden is a lovely wisteria tree believed to be living within the shrine for over 800 years. Home of The Great Buddha. 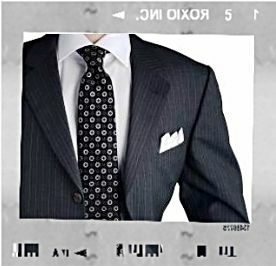 No cameras allowed. At around noon I was already on my way to Todai-ji Temple. 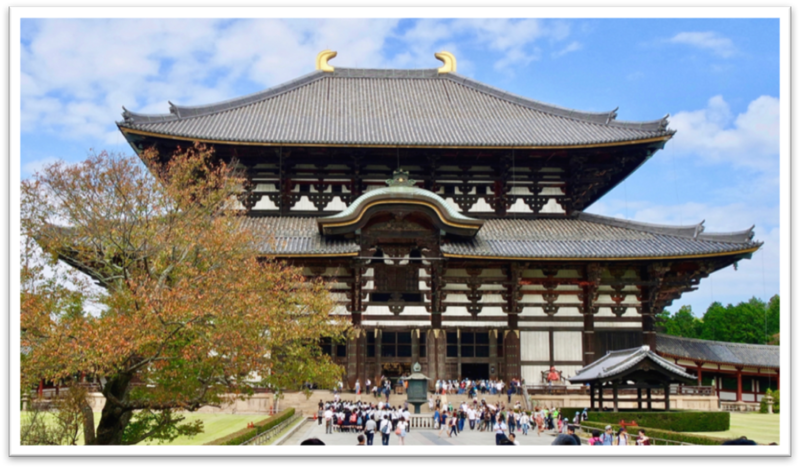 Completed in 752, this temple considered to be Nara’s biggest highlight, not just because of its massive size. This structure is the largest wooden building in the world and houses a 50-foot bronze Buddha known as The Great Buddha, the world’s largest bronze statue of the Buddha Vairocana. Needless to say, the temple is also listed as UNESCO World Heritage Site. After giving some respects to The Great Buddha, I immediately returned to Kintetsu Nara Station for my last temple visit that day. Serene pathway that leads to Hozanji. Hozan-ji is a Buddhist temple located at the belly of Mt. Ikoma. I so love this temple, not only did I experience my first cable train ride in going here but this temple has developed the inner spirituality in me. Mt. Ikoma itself was originally an object of worship for the ancient people in the region, that is why the area was selected as perfect location for Hozan-ji. Said to have opened in 655, this place has been a training site for many Buddhist monks (ascetics) of ancient history. I can live here as an ascetic anytime. I immediately felt the character of this place as I walked alone on its pathway lined with thousands of stone lanterns on both sides. Inside the temple complex is the main temple and several small temples where religious picture tablets are hung. The temple also enshrines an idol with an elephant head and human body, which is one of Japan’s Three Great Sacred Gods. This God is not seen much in Japan. The air within the temple complex was filled with smells of burned incense that creates an austere atmosphere. I have not seen any other tourists or any human beings around except for a couple of monks who seem to inhabit the complex. That place was a pure bliss. I can live there and be an ascetic anytime. Hozan-ji landed on top of my list as the best place in Nara for spiritual journey. I returned to Kyoto nearly dusk that day conveying a profound happiness that I never felt before. I spent more time at the rooftop of Kyoto Station watching Kyoto skyline as daylight fades into a cool and balmy evening. My last night in Kyoto. Please click HERE or the hyperlink below for the second part of my Kansai visit blog. 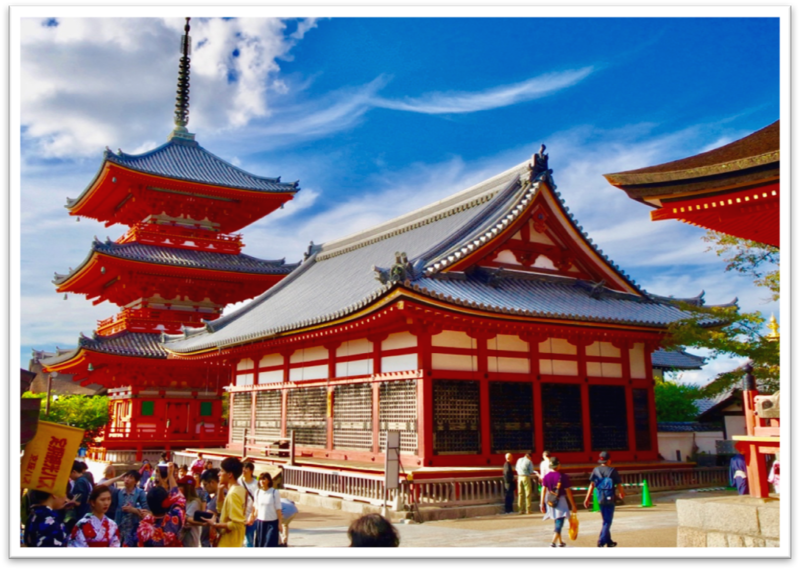 This entry was posted on August 9, 2017 by thecorpslave and tagged Arashiyama, Chionin, Fushimi Inari, Honganji, Hozanji, Kamigamo, Kansai, Kasuga Taisha, Kinkakuji, Kiyomizudera, Kofukuji, Kyoto, Mt. Ikoma, Nara, Osaka, Sagano Bamboo Forest, Shimogamo, Todaiji, Zaka District.